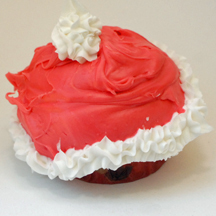 There’s a huge amount of frosting on this cupcake, so prepare for a Santa-themed sugar shock. There are several ways you could approach a Santa hat design, but I didn’t feel like getting out the pastry bag and 1M swirl tip, so I just piled on the red frosting and whipped out my can of Betty Crocker Decorating Cupcake Icing. What You Need: 1 cupcake; frosting tinted red (use no-taste red in paste form for best results); white aerosol icing. How to Make It: Pile on a nice, tall mound of red icing. Use aerosol icing with star tip attached to pipe a border around the rim of the cupcake and a pom pom for the top of the hat. This entry was posted on Sunday, November 9th, 2008 at 8:49 pm	and is filed under Christmas cupcakes. You can follow any responses to this entry through the RSS 2.0 feed. Responses are currently closed, but you can trackback from your own site.